I was so surprised during last month’s US Open to realize that I’d never featured this name! 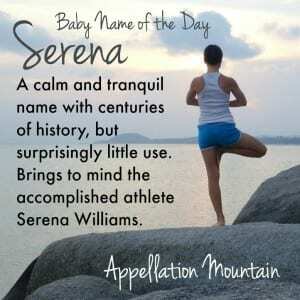 Our Baby Name of the Day is the celebrated Serena. Serena comes from the Latin word serenus – clear or tranquil, also the source of our word serene, as well as Serenity – a current Top 100 favorite. Edmund Spenser used the name for his 1590 poem, The Faerie Queen. The Dictionary of Medieval Names from European Sources has the name recorded in Spain as early as 1488. Way back in the fourth century, there’s a Serena in the Western Roman Empire. Earlier still, there’s a(n almost certainly) legendary Saint Serena, recorded in the third century. 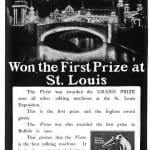 In 1880, Serena ranked #466. 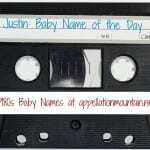 In 2014, the name charted at #455. In between, it’s bounced from a high of #209 in 2000 to being unranked for most of the 1910s through the 1950s. 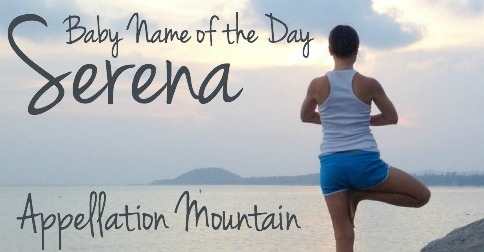 This makes Serena one of those familiar, but seldom shared names. It’s tough to peg Serena to a specific decade. Dancer Serena Wilson, born in 1933. The daughter of vaudeville performers, her claim to fame was belly dancing. Despite having no Middle Eastern heritage, she studied dance while her musician husband studied the region’s music. They became favorite performers in the 1950s. Wilson also helped change the image of belly dancing from something not quite respectable to a more mainstream form of dance. In E.B. White’s 1970 novel, The Trumpet of the Swan, a mute swan called Louis tries to find his voice in order to impress his beloved, another swan named Serena. The name has been given to fictional television characters on Bewitched, The Waltons, Law & Order, Sailor Moon, and Gossip Girl. None of the television uses correspond closely to the name’s peak use. What might explain Serena’s rise in the 1990s is the 1993 marriage of Viscount Linley – Queen Elizabeth II’s nephew – to the well-born Serena Stanhope. The couple isn’t much in the public eye today, but I imagine that their wedding attracted enough interest to encourage a rise in the name’s use. Sailor Moon debuted in the US a few years later, when the name was already rising, so that could be a second boost. While the names aren’t related, Serena sounds like siren – as in the mythological creature that’s cousin to the mermaid. Some mythologies prefer the term sirena. In 2011’s installment of the Pirates of the Caribbean franchise, On Stranger Tides, a mermaid captured by Blackbeard answers to Syrena, which sounds pretty much the same. Other sound-alikes include Sarina, which could be a respelling or possibly a form of Sarah. Sarina enjoyed some use in the 1990s, but has faded quickly. She’s a household name. The #1 ranked women’s singles tennis player, and one of the women to hold this title longest, Serena Williams has won all of the major tournaments, and currently holds the most titles of any active player. Sister Venus Williams’ name is even more daring, and Venus also has an impressive record as a tennis player. Ms. Williams’ energy and athleticism aren’t necessarily in keeping with the calm image the name projects. And yet, it’s easy to imagine parents naming their daughters after the accomplished Ms. Williams. Overall, Serena makes a great stands-out/fits-in name. 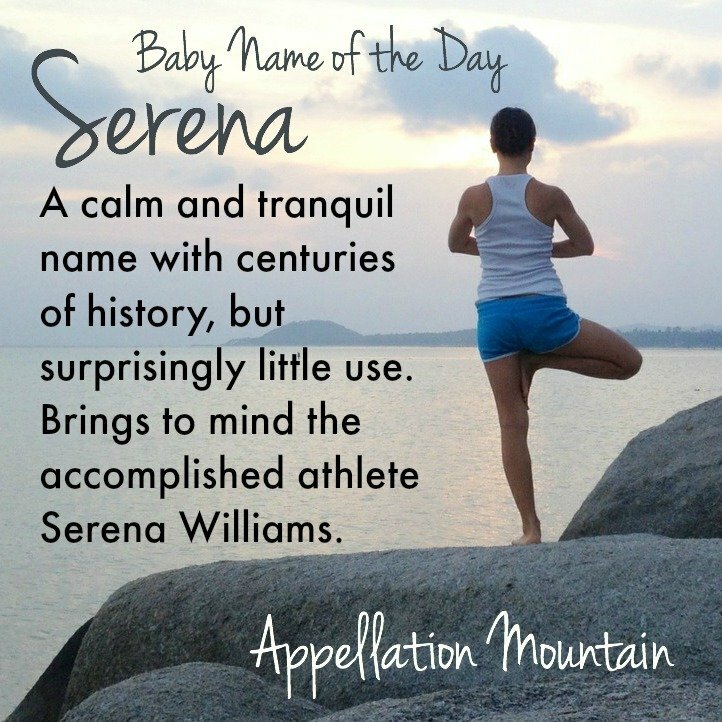 It’s surprising how infrequently this name has been used over the decades, and it’s easy to imagine Serena sharing the playground with Olivia and Sophia. What do you think of Serena? Do you think it qualifies as an underused gem? 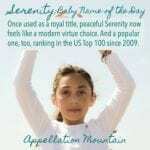 Would anyone consider the more popular name Serenity a deterrent from using Serena? Know a teen-aged Serena. It suits her well and is elegant. Lovely choice. I love Serena, the name and the athlete. I like Serena. 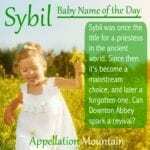 It’s a pleasant name and I can’t see any reason why it wouldn’t suit for a wide variety of people.